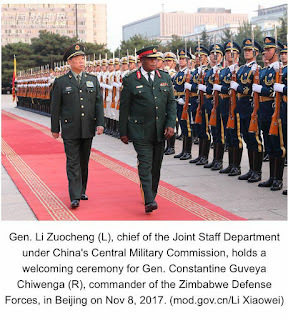 THE People’s Republic of China yesterday said there were no discussions about a military takeover of government when Zimbabwe Defence Forces commander, Constantino Chiwenga visited the Asian country last week. The statement by the Chinese ministry of foreign affairs dispelled rumours for a Chinese backed transition in the country. Chiwenga was in China last week, where he met Chinese defence minister, Chang Wanquan, the same period when, back in Zimbabwe, Harare slipped into turmoil after President Robert Mugabe fired his deputy, Emmerson Mnangagwa following a fallout over the 93-yer old president’s succession. 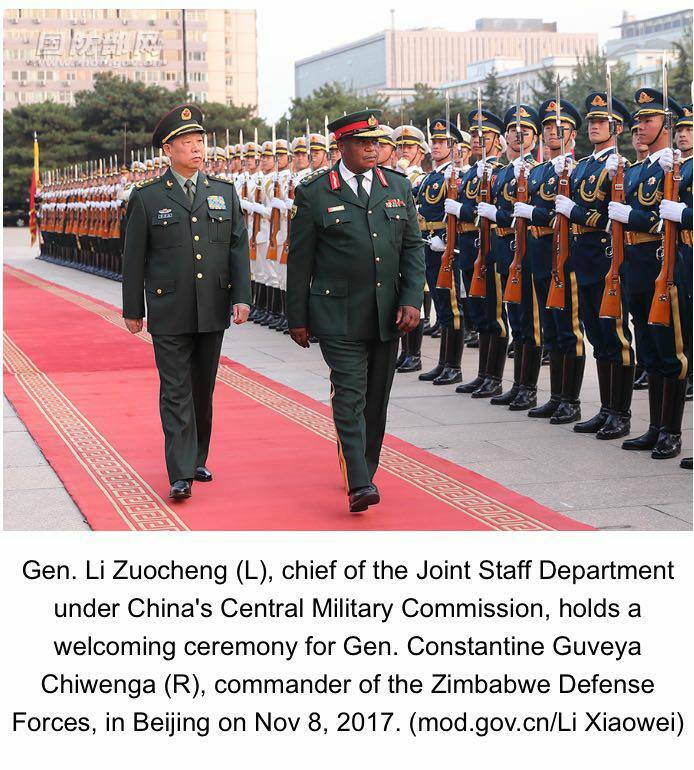 Chinese defence ministry pictures showed Chiwenga and the Chinese minister in military uniform, shaking hands. Other officers from both countries sat opposite each other, holding a meeting at the People’s Liberation Army headquarters in the Chinese capital, Beijing. A few hours after the Zimbabwe Defence Forces took control of the national broadcaster and announced plans “to restore normalcy” in the country. China said it had held normal meetings with Chiwenga. China is one of only a few major countries still maintaining close diplomatic ties with President Robert Mugabe’s regime. The world’s second largest economy said it was closely watching the unfolding situation in the country and called upon authorities in Zimbabwe to “properly handle their internal affairs”, according to a report by The Guardian, a major publication in the United Kingdom. It quoted Chinese foreign ministry spokesman, Geng Shuang, as saying the meeting was a normal military exchange, where Wanquan “later expressed a willingness to promote relations with Zimbabwe”. Shuang said Chiwenga had not briefed China on plans to seize power. “I can only tell you that his visit to China this time was a normal military exchange, mutually agreed upon by China and Zimbabwe,” Shuang was quoted as saying during a daily media briefing in Beijing. “As a country that is friendly with Zimbabwe, we are paying close attention to developments of the situation in Zimbabwe. Maintaining peaceful and stable development accords with the fundamental interests of Zimbabwe and regional countries, and is the common desire of the international community. We hope the relevant parties in Zimbabwe appropriately handle their internal matters,” the Chinese minister was quoted as saying. The intervention by the military, which maintains it has not taken over government comes amid a bitter battle between a group of ruling party politicians, led by Mugabe’s wife Grace, and another group aligned to the fired Mnangagwa over who will succeed Mugabe, who turns 94 years in February, and has ruled Zimbabwe for 37 years. Mnangagwa, a former spy chief with strong support within Zimbabwe’s armed forces, was unceremoniously fired last week. His fallout with Mugabe, who accused him of attempting to usurp power, dramatically opened the road to power for Grace, who had recently hinted at succeeding her husband. The country’s Finance Minister, Ignatius Chombo, who is a key member of Grace’s G40 faction, was said to be among at least three Cabinet ministers detained in the surprise military crackdown early yesterday. The military insisted its action was not a coup, saying “as soon as our mission is accomplished the situation will come to normalcy”.